I love reading non-fiction books to my children, and they love listening to them. We learn together about new people, animals, places or adventures and what we read often provokes interesting discussions afterwards. There are many compelling reasons for reading non-fiction books to your child in addition to the enjoyment you get from reading them. Non-fiction picture books are an excellent way of introducing your child to inspirational true-life characters who can demonstrate just what we are capable of if we have vision and determination. Complex themes, which children might otherwise have difficulty engaging in, are often approached with great success in non-fiction picture books. Authors of such books are masters at simplifying messages and presenting facts in a compelling and absorbing way. The pictures draw your child into what could otherwise be a fairly dry subject. 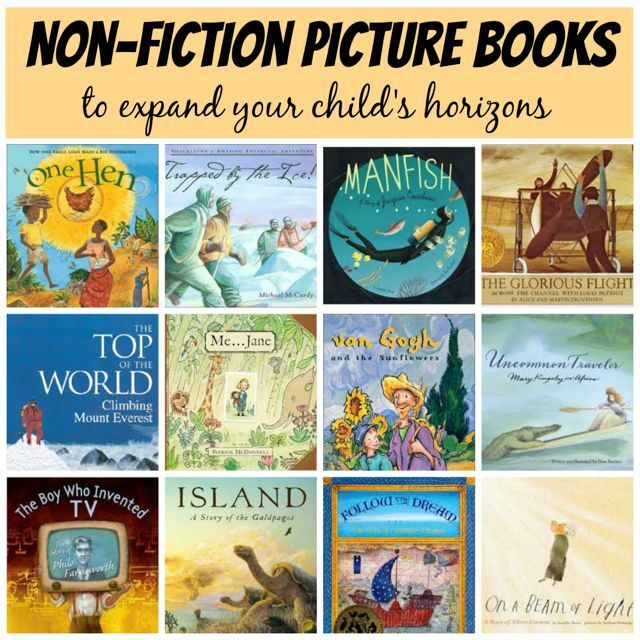 Non-fiction picture books can be the perfect choice for a reluctant reader. Boys are often drawn more towards non-fiction than towards fiction and these books, with their strong characters, eye-catching illustrations and compelling themes might be just what your son needs to get him reading. Non-fiction books also broaden your child's pool of background knowledge and help to develop their vocabulary, both of which contribute to improving their reading skills, by boosting comprehension and fluency. As your child progresses through the school years, they will encounter more and more non-fiction texts as a source for learning new material. Non-fiction texts are written in a different language style to fiction texts. If your child is introduced to this style of text early on in the form of non-fiction picture books, they will find it easier to engage with such texts later. I often worry that the picture my children have of the world is a very distorted one where their greatest hardship is not having enough pocket-money to buy the latest toy they 'need' so desperately. I am therefore a big fan of non-fiction picture books which open their eyes to the world around them. These books do just that, but in a way which is appropriate for young children. If the World Were a Village by David J Smith. Imagine if the whole world were a village of just 100 people. What would this village look like? Who would be our neighbours and how would they live? This remarkable book gives us an insight into such a global village with fascinating facts such as of the 100 people - 5 would be from the USA and Canada, 22 would speak a Chinese dialect, 32 would breathe polluted air and 24 would not have electricity. Also - the stand out fact for my children - in such a village there would be nearly twice as many chickens as there were people! One Hen by Katie Smith Milway. This is the story of how one small loan in the right hands can have a big impact. Koyo, who lives in a village in Ghana, West Africa, is given a small loan with which he buys a hen. He sells the extra eggs at the market, making enough money to buy more hens and eventually earning enough to pay his school fees. After finishing school he gradually builds up a poultry farm, hiring workers and paying taxes to improve his community. Wangari's Trees of Peace by Jeanette Winter. This non-fiction picture book is about Wangari Maathai, the environmentalist and winner of the Nobel Peace Prize. Wangari is shocked when returning to her homeland of Kenya to see thousands of trees being cut down to make room for buildings, leaving barren land and sparse firewood for the villagers. She embarks on a mission to replace them, one tree at a time. In time her Green Belt Movement spreads throughout Kenya and beyond and thirty million trees have been replanted. Two other excellent non-fiction picture books also by the same author are The Librarian of Basra: A True Story from Iraq and Nasreen's Secret School: A True Story from Afghanistan . The books in this section are not only gripping stories in their own right, but they also help to demonstrate just what man is capable of if he has the will to succeed. These books teach your child the importance of endurance, resilience, persistence and teamwork. Trapped by the Ice! by Michael McCurdy. The story of Ernest Shackleton's amazing adventure in 1914. What started as an attempt to be the first to cross the Southern polar cap turned into a remarkable true-life survival story when Shackleton and his crew are stranded in one of the harshest regions of the planet. Trapped in the ice it takes them two hard years to eventually reach safety. Flight by Robert Burleigh. A dramatic account of Charles Lindbergh and the first solo transatlantic flight from New York to Paris in 1927. The stunning double-spread paintings convey the thrill and terror of this momentous flight. Another engaging non-fiction picture book by the same author is Black Whiteness: Admiral Byrd Alone in the Antarctic which tells of the harrowing winter spent by Admiral Byrd alone in a bunker beneath the snow in the Antarctic in 1934. The Glorious Flight by Alice Provensen. This Caldecott Medal award winner tells the story of how the inventor Louis Blériot persevered to build a flying machine which crossed the English Channel in 1909. A story about persistence and dedication - it took the determined and creative Blériot eleven tries until he finally made it, crossing the Channel in 36 minutes. The Top of the World: Climbing Mount Everest by Steve Jenkins. In this stunning non-fiction picture book, Jenkins uses paper-collage illustrations to take us on an adventure to Mount Everest. We learn about its history, geography, climate and culture as well as the preparations involved in climbing it and the deadly dangers which await us on the way up. The perfect read for young adventurers. Another equally captivating book by Jenkins and illustrated in the same style is Hottest, Coldest, Highest, Deepest . The Little Ships by Louise Borden. This non-fiction picture book is the story of the rescue by hundreds of small river and coastal fishing craft of more than 300,000 British and French soldiers trapped in Dunkirk in France during World War II. It is told through the eyes of a girl who was determined to help. The Man Who Walked Between the Towers by Mordicai Gerstein. This Caldecott Medal award winner is one of our favourite non-fiction picture books and tells the true uplifting story of Philippe Petit, a French trapeze artist, who surreptitiously constructed a tightrope between the two towers of the World Trade Center in 1974 and then spent an hour performing high-wire tricks up in the sky, with no safety net of course! Reading biographies of inspirational people can help shape your child's view of the possibilities open to them and teaches them that their dreams can be realised through hard work and determination. After reading these books you can talk to your child about the qualities they admire in the person and what your child thinks helped them to succeed. Uncommon Traveler: Mary Kingsley in Africa by Don Brown. After spending a reclusive early life in a small house outside London looking after her bedridden mother, Mary Kingsley finally got the chance, at the age of thirty, to explore the world she had read so much about. Setting off in 1892 for the wilds of Africa, you can read about how this intrepid and resourceful woman fended off crocodiles with her canoe paddle and escaped from snake-filled pits while collecting insects and fish for the British Museum of Natural History. Also by the same author is Odd Boy Out: Young Albert Einstein , One Giant Leap: The Story of Neil Armstrong and Rare Treasure: Mary Anning and Her Remarkable Discoveries . Follow the Dream: The Story of Christopher Columbus by Peter Sis. While telling the story of the life of Christopher Columbus the detailed illustrations in this wonderful non-fiction picture book also convey a real sense of what life was like in the Middle Ages in Europe. Other excellent books by Peter Sis include The Tree of Life: Charles Darwin and Starry Messenger: Galileo Galilei . On a Beam of Light: A Story of Albert Einstein by Jennifer Berne. This is an excellent non-fiction picture book about the genius Albert Einstein, giving an insight into his childhood as a boy of boundless curiosity through to his later life including how he came to his momentous discoveries. Manfish: A Story of Jacques Cousteau by Jennifer Berne. This is another highly recommended and beautifully illustrated picture book by Jennifer Berne, this time about the filmmaker and oceanic explorer Jacques Cousteau. The book describes how Cousteau was a curious and ingenious boy who fell in love with the sea and dreamed of breathing underwater. It goes on to talk about his amateur filmmaking, how he developed the first scuba gear and his devotion to saving the underwater environment. Another great book on Jacques Cousteau is The Fantastic Undersea Life of Jacques Cousteau by Dan Yaccarino. Me … Jane by Patrick McDonnell. This is the story of Jane Goodall, best known for her study of chimpanzees and work on conservation and animal welfare. McDonnell tells the story of a young and curious Jane who is fascinated by the natural world around her and who dreams of a life living with and helping animals. Another highly recommended non-fiction picture book on Jane Goodall is The Watcher: Jane Goodall's Life with the Chimps by Jeanette Winter. Now & Ben: The Modern Inventions of Benjamin Franklin by Gene Barretta. An amusing look at the many inventions of Benjamin Franklin - from bifocals to the lightning rod - with each invention clearly linked to the benefits it brings us today and illustrated in humorous watercolour cartoons. Also by the same author are Timeless Thomas: How Thomas Edison Changed Our Lives and Neo Leo: The Ageless Ideas of Leonardo da Vinci . The Boy Who Invented TV: The Story of Philo Farnsworth by Kathleen Krull. Philo Farnsworth was a passionate and inquisitive boy with a love of anything mechanical and this new, invisible source of power called electricity. In 1920, while plowing a potato field when he was 14-years-old, he developed the idea for how television could work. Eight years later he turned his theories into practice and transmitted the world's first television image. Honda: The Boy Who Dreamed of Cars by Mark Weston. This non-fiction picture book follows the life of Soichiro Honda who fell in love with cars in 1914 when, at seven-years-old, he saw his first leaky, noisy automobile. So started a life-long obsession with cars which saw him become an expert mechanic, a manufacturer of car parts, a race car driver and ultimately a global industry leader and tycoon. The book celebrates his inventive mind, passion for new ideas and determination to realise his dream. Whether it is a book about dinosaurs, turtles, bugs, the amazing diversity of animals or the story of evolution itself, you are sure to find a non-fiction picture book here to captivate and fascinate your little one. Barnum’s Bones: How Barnum Brown Discovered the Most Famous Dinosaur in the World by Tracey Fern. Barnum Brown discovered the first documented skeleton of the Tyrannosaurus Rex as well as most of the other dinosaurs on display at the American Museum of Natural History. As a child he spent all his time gathering fossils and this passion continued into adulthood to the extent that he found more fossils and dinosaur bones than anyone else in the late 19th century. When he unearthed the first T-Rex he finally realised his dream of discovering a new species. The Dinosaurs Of Waterhouse Hawkins by Barbara Kerley. In 1856, when no-one really knew what a dinosaur looked like, the artist and naturalist Waterhouse Hawkins worked with a leading scientist to complete a special commission from Queen Victoria to build life-sized models of dinosaurs envisioned from scientific fossils. The results amazed Victorian England but efforts to build more models in the United States were unfortunately thwarted. Island: A Story of the Galápagos by Jason Chin. This beautiful and informative book illustrated with intricate paintings and full of interesting facts reads like the biography of a Galápagos Island - from its birth from an erupting volcano, through the arrival and development of its unique species which undergo gradual changes to enable them to survive, until finally the island shrinks and sinks back beneath the water. Charles Darwin's visit to the Galápagos Islands in 1835 has a brief mention. Also by the same author are Coral Reefs and Redwoods . What Do You Do with a Tail Like This? by Steve Jenkins. A beautifully illustrated non-fiction picture book full of the amazing things which animals can do with their ears, eyes, mouths, noses, feet and tails. We learn, for example, that lizards can break off their tail as a defence and it will grow back, that elephants give themselves a bath with their nose and that lizards quirt blood out of their eyes. Other excellent books by the same author include Biggest, Strongest, Fastest and Bones: Skeletons and How They Work . One Tiny Turtle by Nicola Davies. One of a series of Read and Wonder non-fiction picture books by Nicola Davies which describes the mysterious life cycle of the loggerhead turtle who swims the oceans for thirty years and thousands of miles before returning to the beach on which she was born to lay her own eggs. The stunning double-spread paintings bring the ocean world to life. Other books in this series by the same author include Big Blue Whale and Surprising Sharks . Are You A Bee? by Judy Allen. This is one of an excellent series of books about insects and bugs for preschoolers from Backyard Books. The book begins by asking the reader if they are a bee. If so, "when you hatch, you are not a pretty sight. You are a larva." The book continues in this way, encouraging your child to imagine what it would be like to be a bee and describing, in simple terms, the world of the bee. The series also includes Are You an Ant? , Are You a Spider , Are You a Ladybug? and Are You a Butterfly? . Walking around art galleries may not be your child's idea of fun, but these books are a fantastic way of introducing your child to some of the masterpieces of the art world in an engaging and amusing way. Should you be lucky enough to have the chance to see one of these paintings for real, reading the relevant book before the visit is also the perfect way to help your child get the most out of the viewing. Van Gogh and the Sunflowers by Laurence Anholt. One of a series of non-fiction picture books by Laurence Anholt which celebrate some of the world's greatest artists and the real children who knew them. One day a strange man arrives in Camille's town - Vincent van Gogh. Camille and his family welcome Vincent and he paints the family one by one. However, not all the people in the town are so friendly and eventually they drive Vincent out of town. Others in the same series are Degas and the Little Dancer , Leonardo and the Flying Boy , Picasso and the Girl with a Ponytail and The Magical Garden of Claude Monet . Katie Meets the Impressionists by James Mayhew. One of a series of 'Katie' books by James Mayhew which introduce your child to the works of famous artists. In this book you discover the impressionist painters by following Katy as she is magically transported into the paintings of Monet, Renoir and Degas during a visit to an art gallery on a quest to find flowers for her Grandmother's birthday. An entertaining story illustrated by appealing watercolours which emulate the style of the Impressionists. Also in this series are Katie and the Sunflowers , Katie and the Mona Lisa and Katie and the Spanish Princess .